Rather than run it everyday Chris has given us permission to run it every few days. In yesterday’s write-ups I discussed why we default to three as the number for the magi; today I’ll touch on why we give them kingly status. Early Christian writers (including some of those who penned the New Testament) made a concerted effort to tie Christ with scripture of the past, and the magi-as-kings interpretation is a post-Biblical example of this continued theological tradition. Though Psalm 72 (including the verse pertinent to this write-up, “May all kings bow down to him, may all nations serve him”) is clearly a literal blessing/prayer from David to his son Solomon, it becomes viewed around the 600s as a prophecy about Christ, a complete departure from its original intent, but one that quickly cements itself in the Church. The problem is that, as prophecy, it leaves some holes, especially a notable lack of kings bowing before Christ. For some, EVENTUAL bowing hundreds of years later by kings and emperors was enough, but some thought it ought to reflect events during his lifetime. Thus, we see the magi transformed into kings in order to account for this theological addition. So this creates some obstacles: the kings are probably not from the same country, or else they would not be true kings. So the all-Persian/all-Babylonian grouping disappears, and we begin to see the varied ethnicity that has become such a staple of nativity depictions. In the 700s, global sociology, at least for Christians, was viewed through a Noahic lens, with the assumption that all of the world’s population descended from the three sons of Noah: Japeth populating Europe, Shem populating Asia, and Ham populating Africa (this latter notion would be used to justify slavery in the United States, citing that Noah’s curse on Ham’s son extended to all his offspring, and that this curse is slavery). With the world thus divided, the kings best serve prophetic purpose by operating as a stand-in for their continents as a whole. So we see each given a fixed position and clear ethnicity, elements which exist to some degree or another to this day. And while two of the kings, Melchior and Caspar, are all over the place, race-wise, Balthazar has been consistently depicted as Sub-Saharan African for the last six hundred years (a likely result of the increased presence of black people in Europe), though his blackness finds its way into writing and art as far back as the 1100s. Balthazar, whose name, along with those of the other two kings, comes from an early 4th century Greek source, serves a symbolic function beyond the geographic. Like the other kings, he takes on the responsibility of being a stand-in for a third of mankind, and as such represents the first stage of life. Balthazar is young, about twenty, the avatar of youth. And though I’ve never read commentary saying so, I’d like to think that this gives added bravado to the gift of myrrh (each of the named gifts is associated with a specific king, traditionally, and myrrh is linked with with Balthazar). Myrrh is an embalming fluid, and I’d like to think that it’s a statement on the cavalarity with which the young regard mortality. 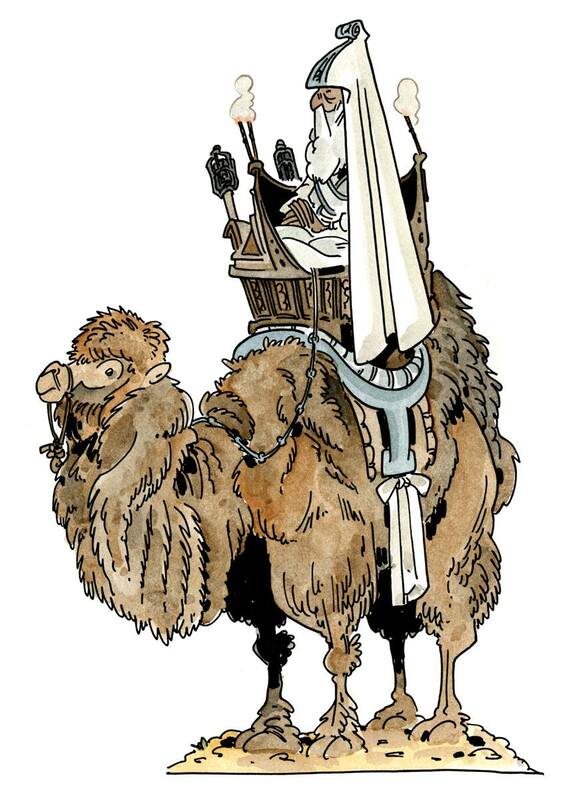 Balthazar is sometimes depicted riding an elephant, but I don’t like that approach. It doesn’t make much sense for someone from Nubia/the Sudan (my take) to be riding an Indian elephant, and there’s little precedent for domesticated African elephants. The latter also gives a kind of Africa-as-fantasy vibe that I think has bad social repercussions. I gave him a dromedary, which would have been abundant in Nubia. And the color palette? Yanked from Franco Zefferelli’s Jesus of Nazareth miniseries, in which Balthazar is played by James Earl Jones. I’ve always been a big fan of Zefferelli’s color choices (both in film and his art direction for opera) and thought this would be a good place to give a nod to his influence. Following up on the writing from yesterday, Melchior is the king whose presence is representative of Asia. A king of Arabia (though in earlier traditions he continued to be associated with Persia even after his co-kings had scattered to India and Babylonia), he serves to showcase the second stage of life, middle-age, and is usually being depicted as being in his forties. 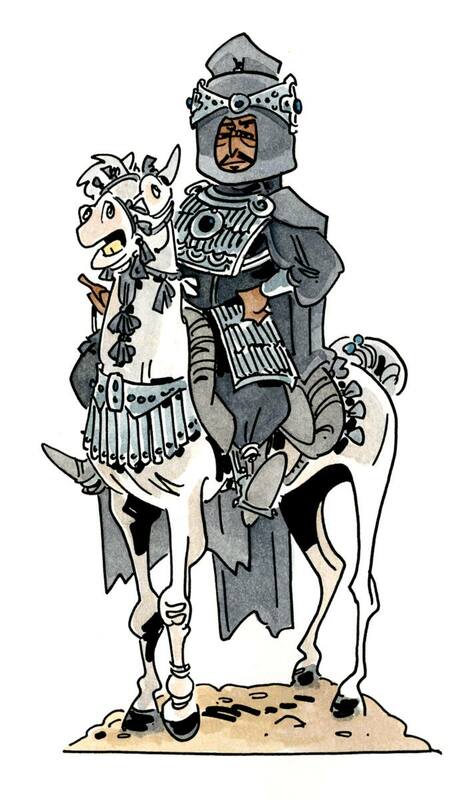 As Arabia is so often associated with equestrianism, he’s often depicted atop a horse, as I’ve done here. Melchior is paired up with the gift of frankincense, generally interpreted as a nod to Christ’s divinity, as the incense would’ve been used in religious ceremony.Though the kings are depicted in nativity art (like here), it’s generally accepted that they wouldn’t have been there. The most popular school of thought is that there was likely a one-and-a-half to two-year span between the birth and the Epiphany, the day in which the Church celebrated the arrival of the magi and thus the revelation of Christ to the gentiles (celebrated on January 6th, from whence we get the twelve days of Christmas, the lead up to the second holiday), which accounts for both travel time needed between when the star appeared to mark Christ’s birth, spurring the magi’s quest, and the order by Herod to kill males under the age of two to eliminate this prophesied rival. Even December 25th proponents who argue for same-season visitation allow for twelve days. Since Jesus was circumcised at the temple in Jerusalem eight days after being born, the likely scenario is either that the family stayed in Jerusalem (only a few miles from Bethlehem) to await their turn in participating in the census, or, having already done so in Bethlehem, returned to Nazareth. Sometimes called “Gaspar,” this is the European king, coming from Turkey (then Tarsus). He’s almost universally depicted as elderly, serving to exemplify the final stage of life. He gives the gift of gold, which is likely where the Tarsus association stems; Tarsus was the big merchant hub, gold its dearest offering. He’s usually the first of the kings to kneel before the baby Jesus, an action which carries with it a lot of significance (and ties them to Psalm 72:11). Kings, unless ceding defeat of pledging fealty, wouldn’t have bowed, and in doing so Caspar both fulfills the prophetic interpretation of the Psalm and mirrors the kneeling of later Christian religious observance. Narratively, his venerable age (and station) give the other kings precedent to follow suit. In many traditions, Caspar was Indian, hailing from the part that is now Afghanistan. There are more theories tying Caspar with historical figures than other kings, most of them to this region. Because of this, Caspar is, like Balthazar, sometimes depicted riding an elephant. Since I depicted the other two in the more generally accepted Noahic tradition, I figured Caspar ought be in there as well, so that there’s thematic unity amongst the three designs. 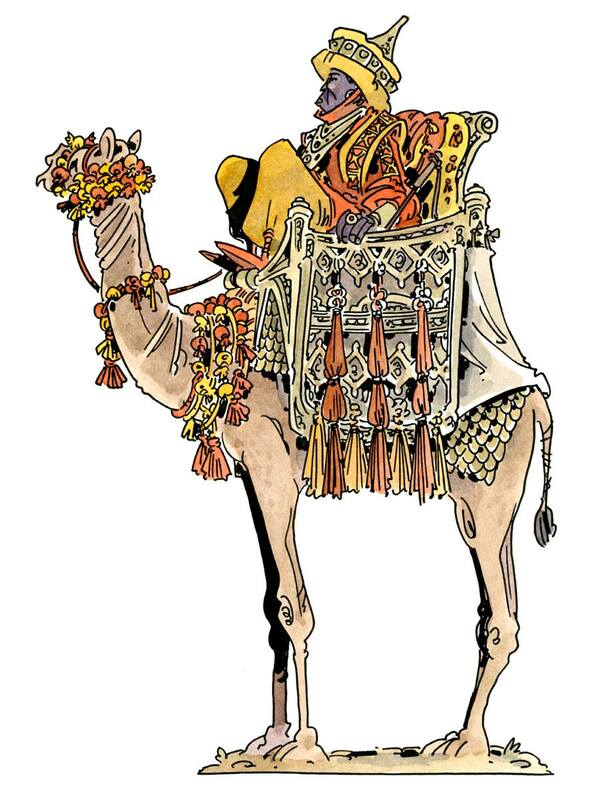 Thus the Turkish rather than Indian version, with the Bactrian camel a nod to the Central Asians that would later claim descent from the Magi, the most notable of whom was probably Kublai Khan.